Montes Spring Harvest Sauvignon Blanc 2015 is the first and freshest of the vintage, where the best possible grapes are harvested early and brought to market early. 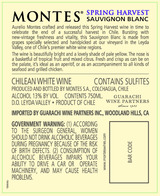 Sauvignon Blanc from Leyda Valley in Chile is renowned for delivering world class freshness and minerality, and Montes produces the region's best. Passion fruit, lettuce, grapefruit and tropical aromas get this Sauvignon Blanc off to a nice start. Zesty, speedy and super fresh on the palate, with blazing acidity, this tastes of passion fruit, green herbs and grass, especially on a racy, slightly pithy finish. The melon, peach and apricot flavors in this crisp white are fruity and fresh-tasting. The creamy finish has plenty of spicy notes. Drink now. 5,000 cases imported.